ST. PETERSBURG, Fla. -- Minor League Baseball announced today that Mike Tamburro, Vice Chairman of the Pawtucket Red Sox, has been named the 2018 King of Baseball. The King of Baseball is a long-standing tradition in which Minor League Baseball recognizes a veteran of professional baseball for longtime dedication and service. Tamburro will receive the King of Baseball Award at the Baseball Winter Meetings Banquet on Sunday, Dec. 9, at the Mandalay Bay Resort and Casino in Las Vegas. "I am flattered and honored to win such a prestigious award," said Tamburro. "It really is an honor that is shared with everyone associated with the Pawtucket organization, past and present, as it has been all of their hard work that has allowed me to receive this honor." Tamburro, a current co-owner of the PawSox, served as president of the PawSox for 31 years (1985-2015) after serving as general manager of the club for eight years (1977-84). He began his career in Pawtucket in 1977 at the urging of the Boston Red Sox who teamed him with Ben Mondor to save the troubled Boston Red Sox AAA affiliate for Rhode Island. The remarkable transformation orchestrated by the duo led to Pawtucket's rise from a previously bankrupt organization to one of the strongest and most successful franchises in all of Minor League Baseball as the PawSox went from drawing 70,000 fans in 1977 to 560,000 fans or more for 15 consecutive years from 1999-2013. Prior to the 1999 season Tamburro spearheaded a $16 million renovation of McCoy Stadium. During his 43-year tenure with the PawSox, over 18 million fans have visited McCoy Stadium. 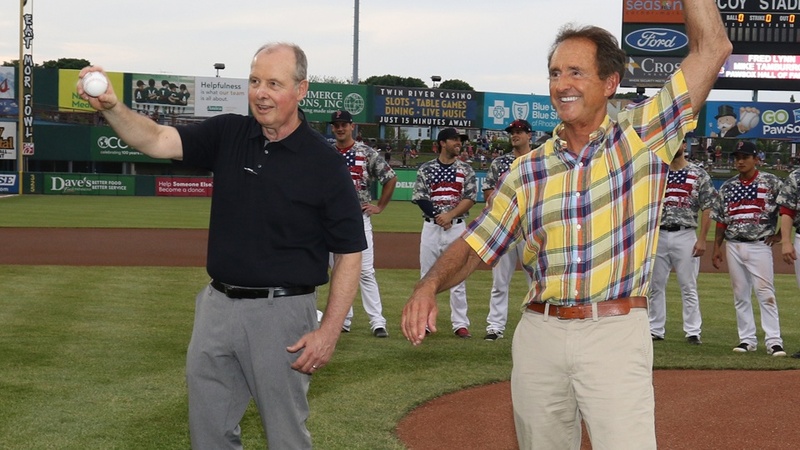 "Mike has been one of the top executives in Minor League Baseball for over 40 years and his efforts on several boards and committees has helped Minor League Baseball reach new heights," said Minor League Baseball President & CEO Pat O'Conner. "Mike has been instrumental in the success of Minor League Baseball and it is my pleasure to present him with this honor." Mike was inducted into the PawSox Hall of Fame on May 26, 2018, and was inducted into the International League Hall of Fame in 2012. He is the only person to earn International League Executive of the Year honors five times (1984, 1988, 2001, 2004 and 2008). He was named the Sporting News Minor League Executive of the Year in 1984 and he led the PawSox to Baseball America's Bob Freitas Award in 1990 and 2003. In addition to his duties with the PawSox, Tamburro has served on several of Minor League Baseball's most prominent committees as he is a past member and former Chairman of the Board of Trustees, a founding board member of the Baseball Internet Rights Corp. (BIRCO) and a Director of the International League. "Mike Tamburro has been a guiding force within the International League and Minor League Baseball for over 40 years, and during that time, there has been no league director or Board of Trustees representative more highly respected and appreciated by his colleagues or myself," said International League President Randy Mobley. "Always one to react with a measured and thoughtful approach, Mike is consistently the voice of reason and the source of sound advice. Mike has been a King within the industry for many years and this well deserved recognition simply makes it official." Tamburro is active in the Pawtucket community as well, as he is a Board Member of the Pawtucket Soup Kitchen, the Bristol County Savings Bank Charitable Foundation, and Meeting Street, and is a trustee of the Pawtucket Boys & Girls Club. Mike created the Pawtucket Red Sox Charitable Foundation which supports numerous charitable groups throughout New England. Mike is a 1974 graduate of the University of Massachusetts with a degree in journalism and sports administration and resides in Seekonk, Massachusetts, with his wife, Anna. They have two adult daughters, Angela and Gina.